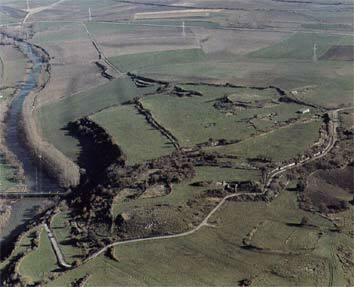 Iruña-Veleia is an archaeological site located 10 km west of the Basque Country’s capital, Vitoria (northern Spain). The site corresponds to the Roman town of Veleia, whose origin dates back to the 8th century BC with the settlement of a Basque-speaking population centre. The town developed itself and considerably grew during Roman times, and continued to be populated for centuries until its definitive abandonment well into the Medieval period. The first excavations at the site took place in 1900. Different archaeological researches would follow along the 20th century. However, it was not until 2006 when the site made some big headlines for the finding of what were supposed to be the oldest texts written in Basque language -probably the oldest language still spoken in Europe- as well as the oldest representation of the crucifixion of Jesus Christ. To add more controversy to the discovery, Egyptian hieroglyphic inscriptions were also found. However, what was probably meant to be Spain's most important archaeological finding ever ended up being "the biggest archaelogical fraud in the history of the Iberian Peninsula" instead. 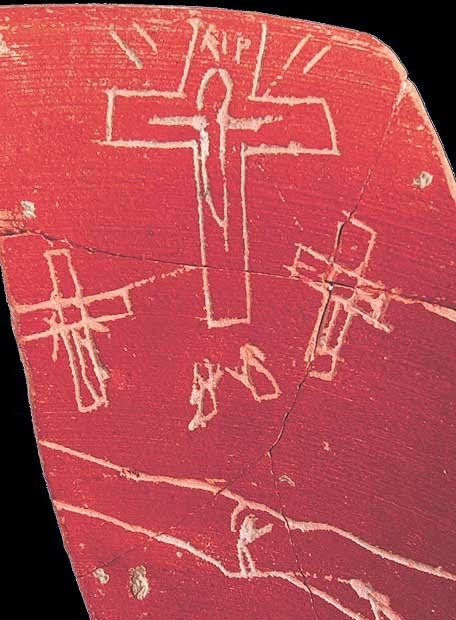 Hereunder is the representation of the Calvary of Jesus Christ carved on a piece of pottery. A crucified Jesus is represented in the middle, accompanied by thieves Dismas and Gestas, who are also crucified. Right under the central cross, there are two figures that probably represent the Virgin Mary and Saint John. Above the central cross, there is a Latin inscription, RIP (requiescat in pace, rest in peace in English). Early analyses revealed that the representation dated from the 3rd century AD, thus making it the oldest representation of the crucifixion. However, a second research carried out in 2008 concluded that, in spite of the pottery being from the 3rd century AD, the representation was a fake. Experts said, among other statements, that the main anomaly was the “RIP” inscription on it. This idiomatic expression has never been found on tombstones before the 8th century and it did not become ubiquitous on Christian tombs until the 18th century. The second point of controversy was a series of fragments of pottery with carved hieroglyphs on them. Along with the hieroglyphs, there were some Latin transcriptions which included names such as pharaoh Akhenaten's wife, Nefertiti. The hieroglyphs represented historical facts occurred in Egypt during the 3rd century AD. As in the case of the false Calvary, the ceramics were from the 3rd century AD but the inscriptions were also a fake. 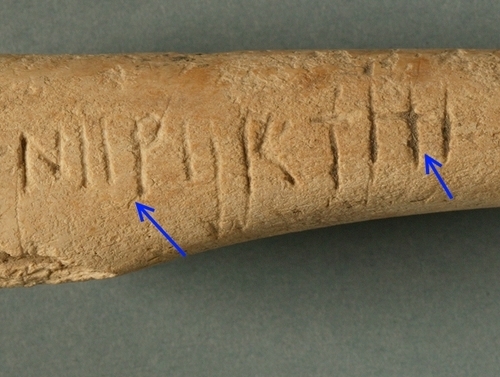 One of the reasons why experts indicated that the finding was not authentic is that Nefertiti appears written as NIIPIIRTITI, which is an 18th-century conventional transcription made by western archaeologists. The many inscriptions in Basque found in Iruña-Veleia caused both surprise and controversy. Basque is an isolated language which survived the Romanization of the Iberian Peninsula and is still spoken by nearly a million people in northern Spain and southern France. The first words of written Basque are found in the “Glosas Emilianenses”, a religious Latin text from the 11th century AD with added comments written both in Basque and an early form of Hispanic romance language (it is still unclear whether it is Old Castilian or Navarro-Aragonese). The finding of the Iruña-Veleia Basque texts would have meant a rewriting of history. However, Basque philologists included in the commission of experts stated that these texts were false, indicating that part of the vocabulary, as well as some grammatical aspects, corresponded to contemporary Basque. All in all, the experts described the whole texts and representations as a crude manipulation, incoherent and “so obviously false as to be almost comical”: an impossible mishmash in which Early Christianity, Basque Language and Egyptian and Roman cultures were deliberately mixed up for some unknown purpose. 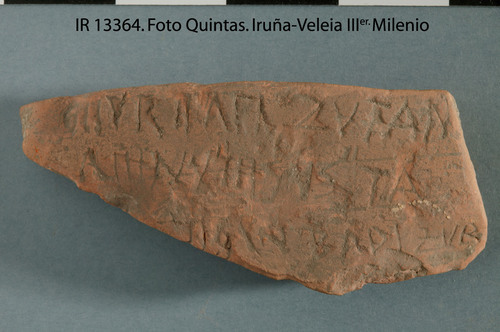 As a result of it, the regional government of Álava (the province where Iruña-Veleia is located) started a legal process against the archaeological team that claimed to have discovered the inscriptions. However, up to today the perpetrator of the fraud and the reason why the inscriptions were introduced into the site remain a mystery.